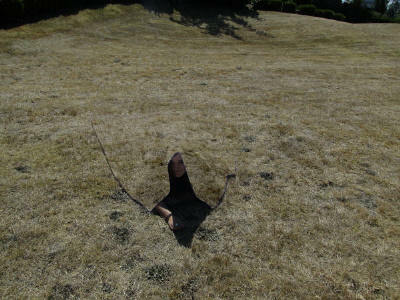 Hyperstealth's "Quantum Stealth" (Light Bending material) Mock-up. These photos are to show the Media the concept, for security issues we cannot show the actual technology. 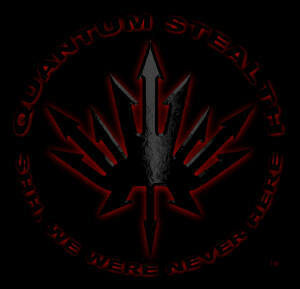 Quantum Stealth has many more beneficial applications outside of the Defense "cloaking" Application. In 2011 Hyperstealth's Cramer announced Quantum Stealth (Light Bending Material)(1) a story which went viral around the world after a 2012 CNN T.V. story on that technology (2). Many remain skeptical that Cramer has accomplished this as the secrecy required on the methodology to protect not only the IP (Intellectual Property) but also Canadian and U.S. Military interests, does not allow for public demonstrations or disclosure of methodology. The U.S. Military was only recently approved by the Canadian Military to move forward with Hyperstealth on this technology under a (MOU) Memoradum of Understanding between the two countries. Many have come forward to say that they have seen and handled Quantum Stealth and it does work as claimed: William Jarvis, 19 year Navy SEAL (Retired) who has accompanied Cramer to a number of these demonstrations in the U.S. and Britain. Colin Worth a 20+ year RCMP (Royal Canadian Mounted Police) officer (Retired) who accompanied Cramer to the first set of Canadian Government Demonstrations. Master Corporal Matt Pitre, Sargent Scott McLeod both Retired Canadian Special Forces and Brigadier-General Larry Lashkevich, (Canadian Forces Retired) who accompanied Cramer on his second and third demonstrations to the Canadian Military. 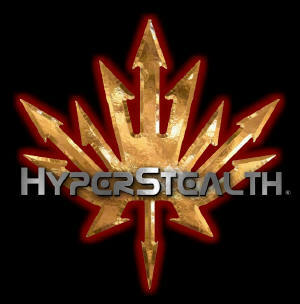 All are now members of Hyperstealth's Advisory Board and further Government confirmation is coming from someone who is not affiliated with Hyperstealth. The Chinese are putting millions of dollars of research into light bending development with 40 different groups of researchers at their universities to allow the Chinese to be the first to claim visual invisibility. On December 17, 2014 an article (3) was release by foxnews.com on the Chinese Efforts. One group out of Hong Kong claims that they have made fish disappear as well as a cat using a large hexagon aquarium tank style apparatus. Cramer, President/CEO of Hyperstealth Biotechnology Corp., has looked at their technology and claims that the Chinese are still in the Stone Age of Light Bending compared to Quantum Stealth. That doesn't mean they have not done it, it just means that their contraption only works at one of six specific angles facing head on to the flat face of the hexagon, do not move up or down, left or right or you as the viewer loose the effect and actually end up seeing this large contraption, whereas the Quantum Stealth works in 360 degrees - left and right and up and down and all the way around the target. After they've absorbed that quote that invisibility is impossible - Cramer then shows them the material which can do exactly that - invisibility In the entire Visual Spectrum and also down into the Near Infrared (Night Vision) and into the Thermal Spectrum (temperature/heat detection). NASA recently used a laser to transfer data at 75 megabytes per second from an orbiting Lunar spacecraft to the earth with Laser Broadband(4). While this technology is already developed, Quantum Stealth being applied can change this system to a wide array where multiple receiving stations could collect the same data rather than just one receiving station pointed directly at the laser. Wires, while a fast method of transferring data, are being replaced with fiber-optics due to their increase in speed and bandwidth. Replacing fiber optics with airborne lasers (using airships or solar powered drones which can stay in the air for months or more to be used as stations to ferry the laser signal over long distances) will reduce these delays further and if it can be done on this large scale, laser bending with Quantum Stealth could also be done in smaller scale to replace wires in computers and household devices for the purpose of increasing processing speeds. Quantum computers use entanglement (a property of quantum-mechanics) to allow for multiple processes to occur at the same time on the same data. With new Quantum Computing where these specialized supercomputers uses lasers instead of wires(8), Quantum Stealth would be your method of bending a wire but in this case it's a laser and while in the past this was done by mirrors that reflect light, Quantum Stealth could change the lasers path and miniaturize the whole process of the current technique of using mirrors.